Many largeframe vespas have ratty, rusty pipes that have been collecting years of carbon deposits and scraping on the ground. Eventually, the exhaust system will need some TLC. My exhaust recently cracked at the weld, so I thought I would show the meaty insides of a stock Vespa exhaust before I try to reweld the thing. 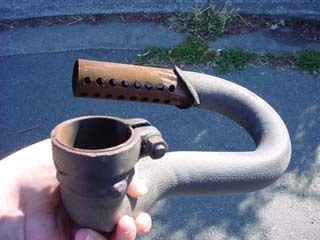 The stock exhaust only consists of a few simple parts. With the exhaust broken apart, we can identify a u-bend pipe that goes from the exhaust stub on the cylinder to a baffle (in this case, a fluted cylinder). There is a convexed piece of metal spot welded to the end of the baffle to direct the charge out the fluted sides or the baffle rather than let it flow straight through. Depending on how these baffles are made, there will be a difference in how the engine operates at certain rev ranges. This is probably as tuned as a stock exhaust get. If the piece of metal falls out of the baffle, it will make a tonne of noise inside the expansion box and may cause a slight loss of performance. 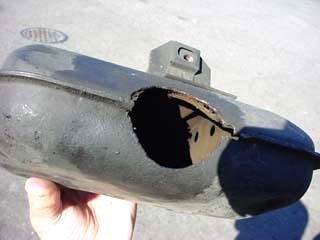 If you shake the exhaust and hear a pronounced rattling, the spot weld holding the blocker has likely failed. The inside of the expansion box is just an area for exhaust gases to occupy during engine cycles. The area in this box forms an air column that reacts to the various changes in pressure caused by the operation of the engine. On the right hand side is a piece of sheet metal that extends from the top of the expansion box to the bottom. The piece of metal has 4 evenly spaced holes to promote the escape of waste gases. The gases enter a smaller chamber behind the wall and escape through the tailpipe to the outside. 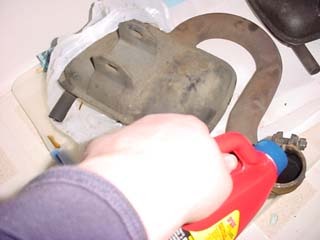 To restore the exhaust, you need to get a carbon dissolving agent like sodium hydroxide (drain cleaner) and pour it, unconcentrated, into the exhaust. The longer it sits the more of the build up will disappear. There is nothing to really come loose as you can see, but don't stick a coathanger down the exhaust, because you may damage it more than help it. A liquid cleaner should be sufficient. There is a wire mesh that lines the expansion box. I have no idea why they put this in other than to stop heat buildup, but avoid trying to decoke the exhaust using a torch as it may damage this mesh and cause some problems. Metal hammer and a 7/8" cold chisel. Start by getting the bike up on blocks. Take the wheel off by loosening the 5 - 13mm nuts on the hub. Pull the tire away and let the bike sit on blocks alone. undo the 17mm bolt behind the tire, you may have to remove the spare tire as well for easy access. 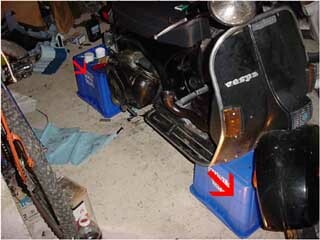 Undo the 13mm (or 14mm) bolt on the exhaust ubend (right below the cylinder behind the kickstart lever). Once you get the 17mm and 13/14mm bolts out, take a hammer and a DULL (make it dull by scraping it on some cement for a few minutes) cold chisel and put the chisel between the cylinder shroud and the exhaust clamp (the clamp where the 13/14mm bolt was). Start banging on it until the exhaust pops off. Take care not to gouge any of the components. Take the exhaust away and leave the bike on blocks. You may want to block the tailpipe (though it shouldn't be that necessary). Put the exhaust on a plastic surface and pour a whole bottle of drano down its throat. DO NOT PUT OTHER STUFF IN THERE! YOU'LL NEVER GET IT OUT! Plug it up, put on some gloves and glasses, and slosh it around a bit. Let stand for three hours. DRANO STAINS REALLY BAD (LIKE BLEACH) KEEP IT AWAY FROM CLOTHING AND CARPETING AS WELL AS KIDS! 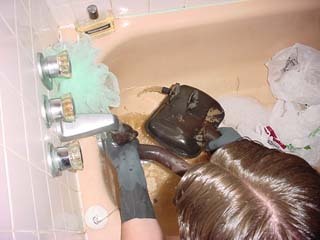 Put on gloves and glasses and carefully move the exhaust to the bathtub. Use HOT water and rinse the drano out by saturating the pipe with water. Don't let the exhaust scrape your tub. shake it HARD to get more and more big chunks out. the most chunky stuff will come out when you allow the twater to exit from the ubend side. 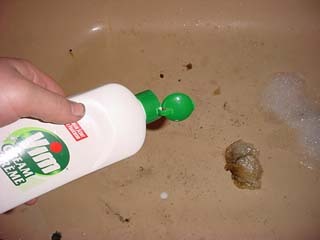 So you don't get killed by your significant other or 'rents, use some VIM to wash the crud from the tub. it will take about 15 minutes to get it all off the tub. Use some plastic bags in the tub to prevent the water from travelling all over the tub. It will make cleanup faster. 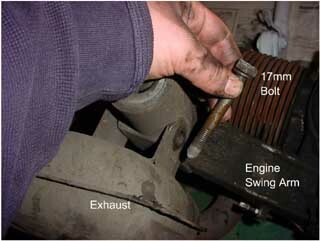 If you have the time, take the exhaust to a high speed wire brushing machine to fight rust better. If you don't have the time, get the loose crap off with a normal wire brush before painting. 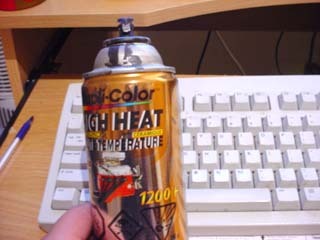 Use some high teperature (1200F) manifold paint on the outside. The stuff stinks real bad, but the smell goes away as you ride. Once it sets up, put the exhaust back on the bike and RIDE!